Psst … Ich beginne gerade mit dem Handbuch des super neuen “Cross Media Designers”. Ich sage nur soviel. Alle, die DirectSmile CrossMedia schon kennen, werden von dem neuen tool noch mehr begeistert sein. Ich sage nur so viel, Betriebssystemunabhängig, leichtes erstellen von Webseiten (wirklich leicht, dass kann auch der Marketing ManagerJ), super schöne (coole) Webvorlagen und tausend geile Ideen sind eingebaut. Also aufpassen! In einem der nächsten DirectSmile Newsletter gibt es sicherlich mehr zum Thema. Psst … Currentyl I’m writing on the new manual of the super new “Cross Media Designers”. 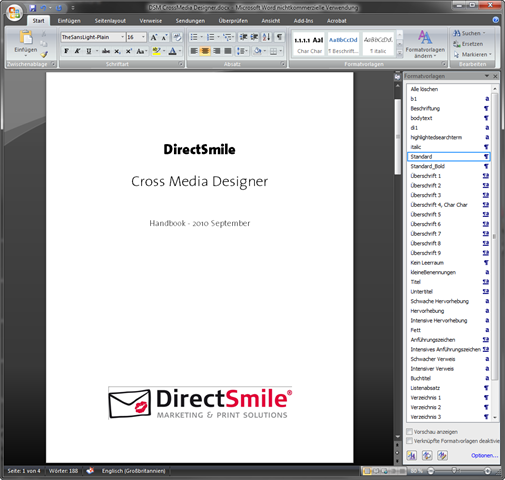 All who know the DirectSmile Cross Media already will be thrilled by the new tool. I only say so much, OS, easy to create Web pages (so easy, that can also the Marketing Manager J), super nice (cool) web templates and thousands of horny ideas are built. So watch out! In the next newsletter DirectSmile there are certainly more on the topic. To the fireplace room is about "meeting rooms  fireplace room"
Although the blog-movies from time to time I’m getting request about the mug project. Therefore the step by step tutorial. What do I need – Software & co? What do I need – sets/docs? 1. In same order we have to setup DSM-Sets and Documents. If we are finished each Set/document has to be transferred to the DSMI- Repository. 3.5. currently do we have two documents on the group “mug” plus several DSM-Sets on the group “Love”. Now let’s prepare the preview-document as “Master doc”. The Document item has a wrench-symbol. Please click on it to get the properties displayed. 3.5.3. Also here you will find “user values” and then “Product group”. Here you have to choose a product group (it’s necessary). 3.6. Now we will connect our Master Doc with the DSM-Sets from group “Love”. That will be managed by “TAGs”. 3.6.1. Bottom right you’ll find “start symbol”. Press the button to create a new TAG e.g. “MugLove”. 3.6.3. Hold on the group “Love” because the final step is still open. On Top, centre we have to press the button “virtual”. to test the workflow you have to finish one order completely. Finally: Automatically your Order (order-item) should be moved from “Unassigned Order Items” into the second WF. If you want to trim a set in html you can use the "clip" command. That means that your image will be placed according to the values top and left to assign the top left corner. The values "rect(200px, 300px, 300px, auto)" are for top, right, bottom and left. Please be aware that the value for "bottom" must be more than the value for "top". And the value for "right" must be more than the value for "left". You can also use "auto" that means that your image won’t be trimmed on this side. Während der Installation des neuesten updates der DirectSmile Software kommt es zu einer Fehlermeldung. Nachdem "OK" geklickt wurde wird die Installation normal fortgesetzt. Der Grund liegt an einem kleinem Teil der Installation der jetzt richtig registriert wird. (war voher nicht der Fall). Bitte nicht in Panik geraten, das ist (fast) normal. During des installation of the latest DirectSmile update you’ll get an "error". But keep cool after "OK" the installation process runs normal and will install the software correctly. Alternatively, the thumbnail-creation in „Mug Project“ you can work directly with transparent *. png background images and not have to take the path of an alpha channel. The film explains how it works.